Description: UP 1610 & UP 1615 eastbound at Patrick. I don't know what caused the dark spot in the center. Turned camera off and back on and it went away. 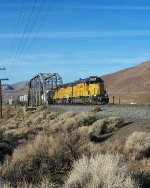 Description: UP 1610 & UP 1615 Fernley flyer heading for Fernley.